Press and Media Kit: A comprehensive in-depth view and history about Operation Hammond. 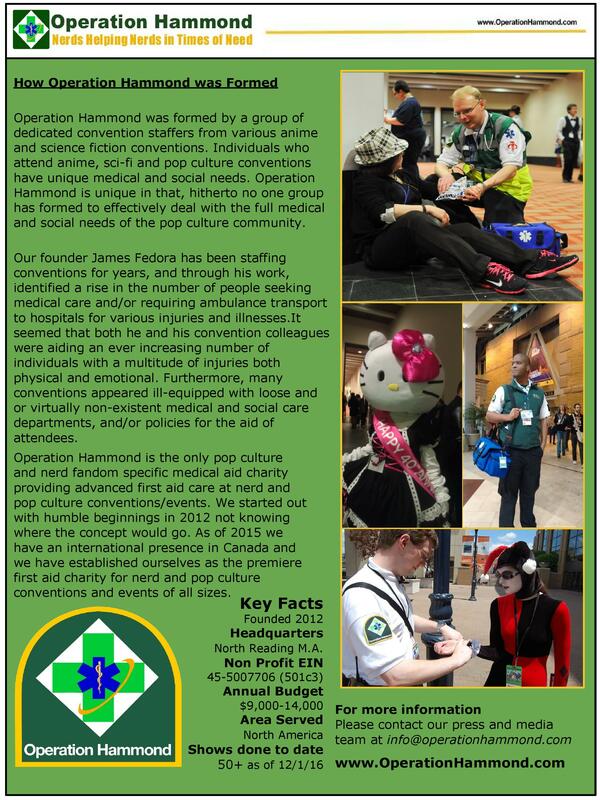 Operation Hammond is the only pop culture and nerd fandom specific medical aid charity providing advanced first aid care at nerd and pop culture conventions/events. We started out with humble beginnings in 2012 not knowing where the concept would go. We have an international presence in Canada and we have established ourselves as the premier first aid charity for nerd and pop culture conventions and events of all sizes. We have diverse experience in convention staffing, event/convention operations, emergency preparedness/training, event medical care, social care, crowd/line management and more. Our members have years of experience staffing nerd/pop culture events and conventions/events and come from a range of backgrounds including EMS, police, social services, public relations, convention staffers, security and more. In this digital press kit, you will learn everything there is to know about Operation Hammond: its methods, policies, and its groundbreaking mission. Operation Hammond is a unique and novel organization. It is the first of its kind. Operation Hammond is a registered 501c3 non-profit corporation. 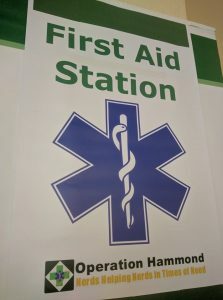 We are incorporated as Operation Hammond First Response, Inc. in the Commonwealth of Massachusetts. 4. Show compassion, care, and kindness to those with social deficits. 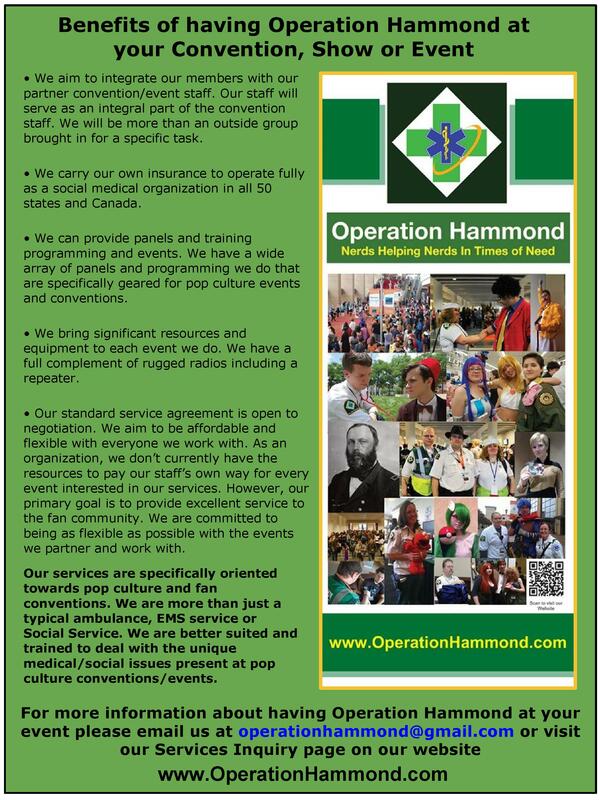 Operation Hammond offers a range of diverse services and training for pop culture conventions, events, and associated organizations. We are experts in the unique needs of pop culture conventions. Our aim is to work alongside convention staff in order to seamlessly integrate our services. 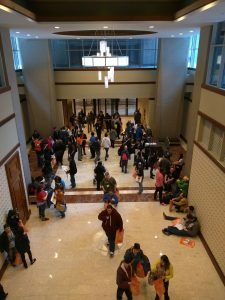 Most of our members are fans and convention goers themselves, or have a deep love of pop culture, and enjoy assisting pop culture conventions and events. We are an entire volunteer organization. None of our members receive financial compensation for their participation or membership. Our members donate their time and skills for the betterment of the fan and pop culture community. 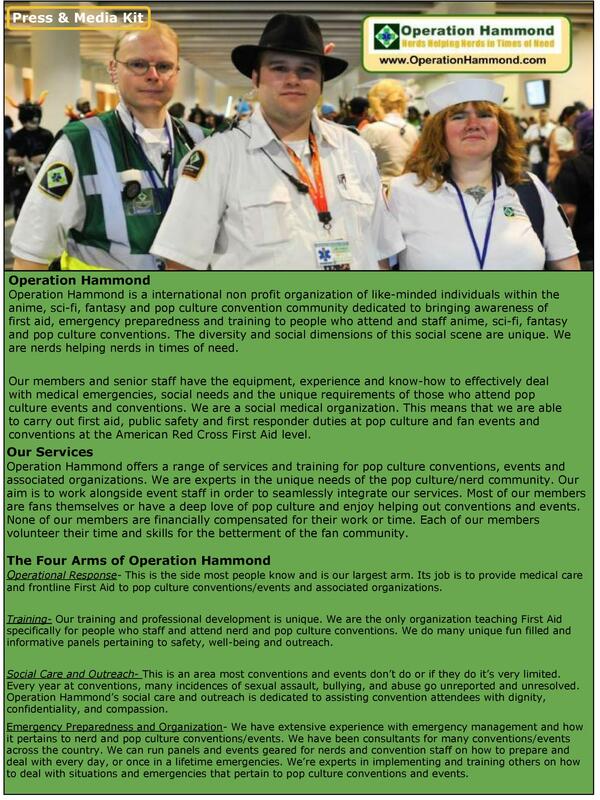 Our core service is providing first-aid level medical staff for conventions, shows, and other gatherings. We have all the equipment and experience to provide advanced first aid response services for conventions/events from 500 to 29,000+ attendees. We operate at the Basic/Advanced First Aid, Medical First Responder or higher as outlined by the American Red Cross and the American Health & Safety Institute. We can tailor our services to your conventions/show requirements. To learn more about the services we offer or to have us at your event please visit our Services page. “I started to become concerned with the rise in medical issues and injuries I was witnessing during my time staffing conventions. As an EMT, I am morally bound to help people in need, whenever possible, to the best of my ability. It seemed that at each convention I staffed, ranging from the very small to the very large, I was calling more and more ambulances and noticing a steady increase in both the number and variety of medical issues that I personally treated and/or assisted in treatment. We are an official American Red Cross Licensed Training Provider and an Authorized American Health and Safety Institute Training Center. We offer training classes and panels in CPR, first aid, emergency preparedness, social care and more, for other nonprofits, conventions, and events. A hallmark of Operation Hammond is our ability to teach our members, partner conventions, and public. We custom tailor many of our classes and panels specifically for the nerd and pop culture convention community. This panel aims to put an entertaining spin on how to deal with everyday medical emergencies. The panel utilizes the popular theme of a Zombie Apocalypse to add a fun spin on first aid and medical emergency training. Did you know Ancient Samurai were firefighters? We all know ancient Samurai were warriors. Not many people know Japanese Samurai have been firefighters since the 16th Century and were known as hikeshi and Machi-Bikeshi. These samurais had unique rough and tumble backgrounds and were the pin-up darlings of the 18th and 19th Century with much of their unique history lost to the ages. Bring your plushie for a uniquely interactive panel to learn how to care for you and your friends in the event of an emergency. Plushies like people wind up in all sort of predicaments both good and bad. Bring your plushie sit back relax and learn the real world basic care and first aid to keep you and your plushie safe. This is one of our most popular panels. Operation Hammond is one of the most progressive and exciting organizations in the fan and pop culture convention community. It is our sincere hope, that with the help of our members, volunteers, conventions and clients, we will grow into the premier social medical charity for fandom. Operation Hammond is committed to serving the needs of the fan and pop culture community. We are nerds helping nerds in times of need, with class, style, and leadership. To download/view, our press and media kit PDF click the link below.